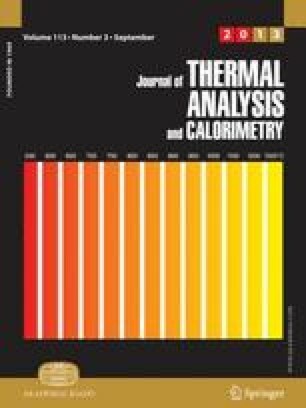 The thermal behavior of Mn(II) silanethiolate series [Mn(SR)2L(MeOH)n], where R=SSi(OBut)3, L=heterocyclic nitrogen base and n=0, 1 or 2 has been comparatively investigated using differential scanning calorimetry (DSC), thermogravimetry (TG) and TG-infrared spectoscopy (IR) techniques. The TG curves indicate the differences in the thermal decomposition due to presence of distinct N-donor ligands and labile MeOH molecules coordinated to the central atom. The first step on the TG curves (60–110°C) corresponds to the elimination of alcohol from respective complexes. The main step (150–350°C) can be assigned to the decomposition of the complexes yielding Mn3O4 and silica as the main final products, identified by X-ray diffraction patterns.